The financial decisions of many people are often based not on who they actually are, but on who they think they are. Whether you are a spender or a saver, a saver or an investor or an investor or a gambler, could all depend on how rich or poor you feel. Note that I said ‘feel’, not ‘are’. What’s even more interesting is that the impact may actually be the reverse of what looks likely, that is, feeling poorer may lead to riskier behaviour. However, this is not about poverty or wealth on an absolute scale, but relative to others that you compare yourself to. 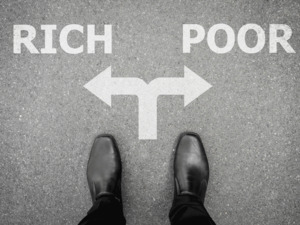 Some time back, I read about some research on the psychological aspects of poverty and inequality which seems to jibe with something I have observed for a long time in the behaviour of savers and investors. A group of economists in the US set up an experiment for which they made a select set of government employees aware that they could find out their colleagues’ salaries through an online facility. Later, they surveyed both sets of people —those who knew their co-workers’ salaries, and those who did not know. As it happened, before the study, the researchers had two opposing theories on how people would react to knowing others’ financial situation. Some of them thought that when employees came to know that they were being paid less than others, they would be unhappy. The other theory was that when employees came to know that others had higher salaries, they would see it as an opportunity for themselves to earn more and therefore, be pleased about earning less than their peers. I know the second idea sounds like a really stupid theory to a normal person, but what can you do, this is the kind of stuff that economists believe in, apparently. The study obviously showed that people who discovered they were paid less were unhappy about it. However, there was a surprise. It turned out that those who were paid more than their peers were not happy about it either, but rather, were just indifferent. They just didn’t care that they were getting more money—it did not make them happy or unhappy. The study concluded that knowing about salaries had “negative effect on workers paid below the median for their unit and occupation” but had “no effect on workers paid above the median”. This happens because people’s behaviour is driven by who, or how many, are above them. No one feels prosperous because there are others who are poorer than them. So how is this important to saving and investing? People who feel they are not prosperous tend to make make bad decisions about investing. The original article talks about ‘the poor’ being prone to gambling and things like that. However, that’s not the kind of thing I am talking about here. Relatively prosperous people, with stable incomes, often don’t have any discretionary savings because they feel that only the rich can have savings and they are not rich. Often, I find that they have some vague notion that some sort of a bonanza will happen in the future, some landmark event, which might make them prosperous and then they will invest all that money. These attitudes are not a result of the absolute amount of money they have. To take just one comparison that I have personally dealt with, a couple with a Rs 14 lakh annual income felt they were not prosperous enough to save like ‘rich’ people do and someone who earned about half of that was steadily putting away Rs 10,000 a month in a balanced fund. Are Rare Seashells A Good Retirement Investment?